1: Rules: Will be interpreted by the tournament directors and all decisions are final. Knowledge of these rules are the contestant’s responsbility. Failure to read the rules or ignorance of the rules is no excuse and could result in disqualification. There will be no refund of any money paid for disqualification. All state fishing and GRDA boating regulations shall apply. must return their issued boat number tags to the Check-In boat prior to their scheduled weigh-in time. Failure to turn in an issued boat number tag will result in disqualification. submit your entry form early. Tournament hours will be 6am (or safe light) with a Weigh-In Time of 3pm for the first (1st) flight, 6:15am with a Weigh-In Time of 3:15pm for the second (2nd) flight, and 6:30am with a Weigh-In Time of 3:30pm for the thrid flight. etc. There will be 50 boats per flight. Trailering will not be allowed. 4: Live Well Check In: All contestants must have their live wells checked by tournament staff to be eligible to fish. Live wells will be checked at the pavilion prior to entering the water, if you arrive by water please make sure you find a tournament official and get your live wells checked. A ribbon will be tied to the contestants trolling motor so that they can be identified while on the water. Any team failing to get their live wells checked will be disqualified. 5: Scoring: Will be based on a five (5) fish stringer. Length will be a minimum 14” limit. A courtesy board will be made available for use prior to weigh-in. 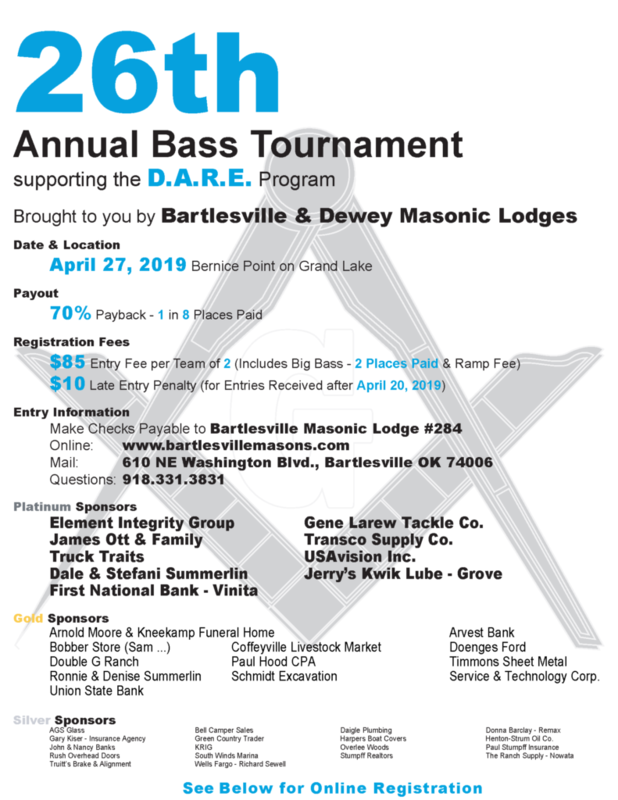 Short fish brought to the weigh-in will reseult in disqualification (It is unlawful to possess a bass shorter than 14”). Official tournament board will be the golden rule. Only Largemouth, Smallmouth and Kentucky bass will be accepted. Only five fish can be brought to the weigh-in. Anymore will result in disqualfiication. Dead fish Penalty will be 1.00 lb. per dead fish brought to the weigh-on (no exceptions). Cull immediately only (5) fish are allowed in the live well. At least one team member must be present to witness the weigh-in. All fish will be weighed on official tournament scales. Weigh staff will accept only those fish brought to scales in the tournament provided bags. 6: Tackle & Equipment: Only artificial baits and lures. No trolling. All bass must be caught on rod and reel and landed from the contestant’s boat. 7: Permitted Fishing & Location: Will be anywhere on the designated lake unless specified before the tournament begins. No fishing permitted within 50 feet of another contestant’s boat. This will be enforced. There should be no need to encroach on another boat. No fishing within 50 feet of any gas or commercial dock. At no time will any fishing be allowed off a private or public dock, as contestants must remain in their boat during the tournament except for emergencies. All fish must be caught on the day of the tournament and on the tournament lake. 8: Boats, Moats & Equipment: There will be no horsepower restrictions as long as the boat is coast guard approved. Life jackets and kill switches must be in place when the boat is on plane. 9: Money Ties: In case of a tie the winner will be the team with the most fish. If the tie continues then the team with biggest fish will win. If the tie still exists then the winner will be determined by a coin toss. 10: Mail-In Cut Off Date: Postmarked by April 20, 2019. Late entries will be accepted at the ramp with a $10 late fee penalty. 100% of the late fees will go to the D.A.R.E. Program. Late entry penalties must be paid in cash or by credit card at the ramp. communicating their intent to withdraw will receive a full refund. 12: Release: All Participants must sign a tournament release (provided) before the fishing tournament. It is also considered permission to use any statements, photographs or other matter to be published in magazines or other publications. 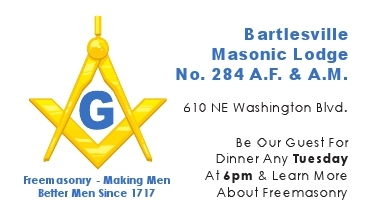 By signing the entry and release form you are agreeing to release the Bartlesville Masonic Lodge #284 and Dewey Masonic Lodge #466, all sponsors and the Grand Lake Authority from all liabilities or claims. during the tournament hours or during the weigh-in will result in immediate disqualification. By checking the box, you acknowledge that you have read and understand the D.A.R.E. Bass Tournament Rules.